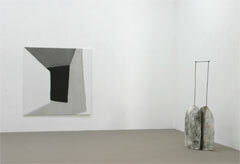 Drawings by Jan Wawrzyniak and sculptures by Gilles Suffren share space at Galerie m Bochum’s latest exhibition. Traditionally attributed with quite disparate properties, the two genres demonstrate here fascinating echoes in their pictorial and formal language. 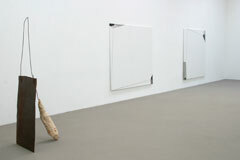 Jan Wawrzyniak, born 1971 in Leipzig, already had works on show at Art Cologne in the 1990s and has received several grants. His coal drawings, usually large in format, guide us to undefined, unnamable places. In his reduced pictorial language, skillfully arranged lines and planes emerge directly from the drawing process. The first application of coal on the white-primed canvas sets the course for the further unfolding of the drawing, without the artist following a preconceived plan. Wholly “untouched” white surfaces, shot through with finely nuanced gray tones or deepest black, tilt toward one another, coming forward or receding back into an incalculable depth. Reminiscent of a Kafka tale, they evoke a mysterious atmosphere of unease. The impression given by the sculptures of Gilles Suffren (born 1953 in the Provence), by contrast, is by turns bizarre and whimsical. With their combination of fired clay and iron, they master a precarious balancing act, maintaining a highly sensitive relationship between mutual stresses and supports. The materials’ properties, their heaviness and hardness, flexibility or fragility, are immediately palpable to the viewer. Organic and geometric forms, in possession of amorphous or smooth surfaces, enter into a tension-filled juxtaposition, adeptly exploiting the possibilities of the material to the full. Despite their actual weight, the sculptures sometimes seem dancingly light and delicate, playful and poetic.